Video for latest virtual reality application and installation, ‘AWE’: Awe-inspiring Wellness Environment. Read more about it here. I presented a TEDxSFU talk this month, and it was one of the toughest things I have ever had to do. I can’t put into words what it means to me to be chosen to give this talk, and my gratitude extends to the TEDxSFU organizing committee, the TED community, and my colleagues at the iSpace Lab for their support. Most of all, I am grateful to the fellow TEDxSFU presenters who have helped me refine this presentation and give me the confidence I needed to tell my story. I’ve long considered it career suicide to disclose any perceived weakness or vulnerability in public, and my fellow TED peers helped me every step of the way to overcome this fear, with the greatest support coming from the TEDxSFU coach, Bernhard Riecke. I hope you enjoy the talk! 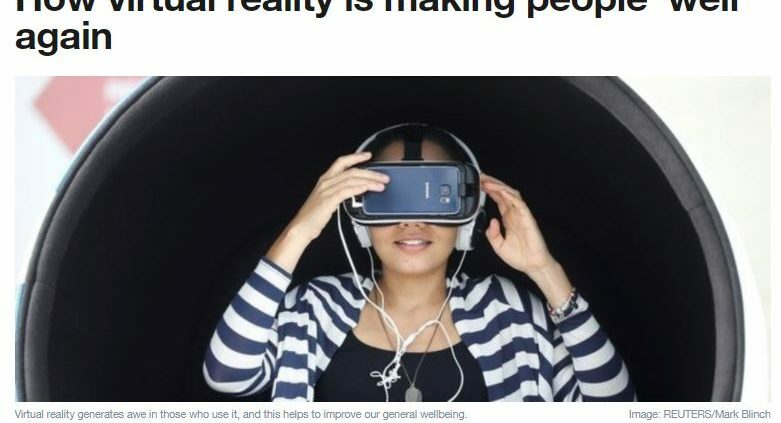 The World Economic Forum (WEC) has posted my essay under their new heading “How virtual reality is making people ‘well’ again”, and can be found here. It is a great honour to be published on WEC, as they have identified the immersive realities as fundamental part of their Fourth Industrial Revolution Agenda item, and the WEC strives to constantly improve the state of the world. Virtual reality generates awe in those who use it, and this helps to improve our general wellbeing. I had the honour and priveledge to author an article for The Conversation Canada this month. I describe the research we are doing at iSpace Lab at SFU, and what it could potentially mean for improving our lives. November 28, 2017 6.26pm EST. Individuals wearing virtual reality headsets often look isolated. But research shows they can experience profound emotions such as awe, which enhance their feelings of social connection and wellbeing. The study participant removed her headset. She still had goose bumps on her arms — even though the room was a toasty 25℃. She had just spent 10 minutes inside our immersive virtual reality (VR) environment. It was like a surreal dream, and unlike many VR experiences, it wasn’t a game, and the goal was not to entertain or make money. It was research — investigating the potential of awe-inspiring VR experiences to create social connectivity and improve individual wellness. “I felt more connected to the universe, and that my problems were going to be OK, and going to work out somehow.” She laughed and wondered if this was a bizarre thing to say. As our interview wrapped up, she paused at the door. I design virtual reality environments, interfaces and experiences. Under the direction of Dr. Bernhard Riecke, in Simon Fraser University’s School of Interactive Arts & Technology’s iSpace Lab my colleagues and I study how people interact with the technology. We also research how to design these experiences, at a time when few frameworks exist. Many people today are familiar with immersive virtual reality. This is a multi-sensory, often highly interactive, platform that enables people to be “present” in the virtual environment — to the extent that their body and mind believe what is happening is real. It draws on multiple senses — using visuals, audio, touch and even scent — to help the participant become emotionally invested. 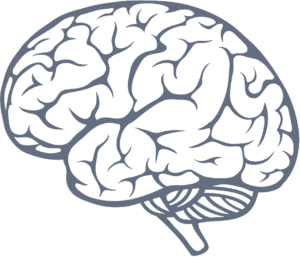 Each of our senses influences our perception and cognition, and the brain uses these senses to form a reliable model in which we guide our decisions, emotions and behaviour. In an immersive VR environment, we are effectively constructing a real extension to our own reality and how we see the world. People may look down from a great height virtually and their heart starts racing. They might physically jump when something unexpected happens in their perceived virtual space. I’ve seen people cry, hug, dance and meditate in immersive virtual environments. And we find that these VR experiences can be profoundly positive. Our research shows that they can inspire a sense of awe and that this can be socially connecting. Other research has shown that VR can help foster pro-social attitudes and behaviours as well pro-environmentalist behaviours. It can help medical students understand the lived experience of their patients. And it can facilitate perspective shifts. Viewers of the virtual reality film Across the Line in the United States, for example, showed an increase in empathy towards women having abortions after the experience. Despite the image of VR as an isolating or goofy solo activity, it can actually bring people together, irrespective of where on the planet they are. And VR can transcend other boundaries, like bias: you don’t know the other participants’ age, gender or appearance. Perhaps, the most compelling thing VR can do is invisible, and deep within our psyche? My first VR experience was in 2002, when I then entered “Osmose,” created by Canadian artist Char Davies. The emotional intensity I felt was memorable. As I breathed in and out, a respiration sensor in a physical vest translated my breath into environment variables. It allowed me to rise and fall in a gentle, weightless manner inside the virtual environment. Inside the headset, I was united with a virtual tree and glowing particles floated around me like fireflies. The experience was profound, and showed me that VR could assist in subtle communication using the body’s own cues. Words weren’t needed, nor was an arcing storyline. This was important for me as a young adult with a painful inflammatory arthritis condition. For a while, my body and mind felt relieved through a feeling of weightlessness and desire to share the experience with others. The capacity of VR to expand our mental models is similar to that of generating empathetic understanding — towards others, the planet and even ourselves. Does this mean VR can “make” a person more empathetic? Not quite. It could help expand the lens in which you see the world and others. But it is not an “empathy machine” that can automatically create empathy with a button push. When designed with specific experiences and emotions in mind though, like awe, the VR experience can demonstrate great potential to assist us in empathetic understanding and pro-sociality. On the transformative index of emotions, awe is important. It is one of the few experiences that allows people to transcend themselves and to feel part of a greater collective. We understand this happens through perceived “vastness or scale,” where a person experiences something huge, and “accommodation,” a process that modifies our existing cognitive schema to include new information. This doesn’t mean that people always need to see something physically massive. Many people experience awe by watching an inspiring public speaker, by attending a concert or seeing artwork. Regardless, awe is relatively rare for most of us, as our busy everyday lives often don’t include weekly concerts, solar eclipses and visits to natural wonders. Virtual reality is a young medium and we are still learning how to design an awe-inspiring or emotionally-moving experience. Our approach uses research and “co-creation” in collaboration with research participants — to develop design ideas. We design an initial prototype based on what research tells us works, then we try it with people. Based on their experiences, we go back and iterate the design. We repeat the process until we get some consistency of response. For example, a study we ran in 2016 revealed participants feel a sense of awe when touring the planet in Google Earth VR, and we had some interesting initial findings on pro-sociality. Google Earth VR uses street view and aerial data of our planet that appears life size in the virtual environment; a person can fly anywhere in the world and explore. Among the participants who reported the highest ratings of awe, nearly half experienced “frisson” — chills and a physical goose bump reaction to awe-inspiring events. And when we dug deeper into the data, these participants also reported a strong social connection during the VR experience. In our study, one participant suddenly started speaking aloud while in the environment. “The fence is still there, the house looks the same,” he stated. “I remember this place.” He had just visited a childhood home he hadn’t seen in more than 20 years. An interview afterwards revealed he hadn’t been to his country of birth in seven years, due to a tight budget. He also rarely connected with his immediate family, due to time zone differences. A few days later, he booked a flight. “It’s a milk run, like four stopovers, but it was cheap and I’m doing it!” he said. Loneliness is on the rise. In a country where one-person households are the most common type, people are reporting increasing feelings of disconnection. And this is a global trendbringing negative social and health consequences. VR environments may be an antidote. They may increase feelings of social connection. They may be beneficial for people going through a rough spot. 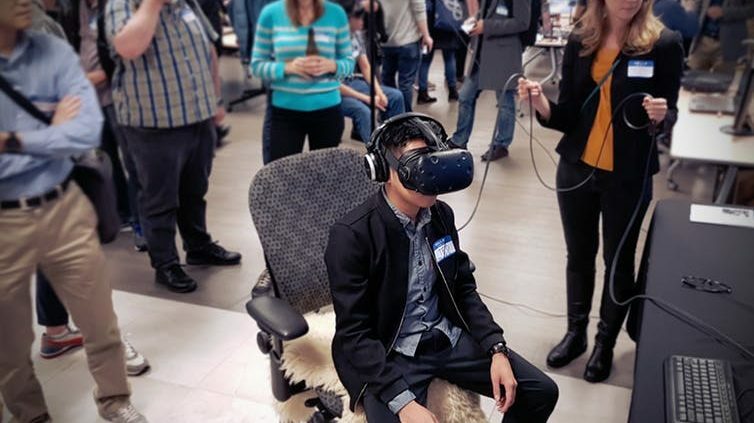 With the support of Simon Fraser University, Social Sciences and Humanities Research Council (SSHRC), Natural Sciences and Engineering Research Council (NSERC), and through collaboration with The Centre for Digital Media, our team is bringing VR environments into workplaces and homes. If we can inspire people with diverse backgrounds and skill sets to build their own VR experiences, great things could happen. We’ve just seen a taste through awe-inspiring environments. The realities we can embody are vast, and the potential to expand our lens on life is magical. Technology is advancing tremendously and now, we're able to create virtual realities for ourselves. But what role does technology play in defining the meaning of humanity for us? Come listen to Denise Quesnel speak on the shift that virtual reality is creating in our world! What makes a good TED talk? Outside the usual ‘practice makes perfect’, there’s a specific thing TED does that makes their talks so powerful. What I didn’t know when I first was selected to give a talk at TEDxSFU, was that we practice our talk upwards of 6 times in front of our fellow presenters and TEDx organizers, a TEDx coach, and all these people together help craft the talk. The presenter may start with the initial presentation and idea, but it is together as a collective that we provide feedback, suggestions, and iterate on these ideas again and again to make it great. This means we get to know each other very well, and we witness moments of vulnerability and genius in each other. It was tremendously moving to go through this will all the speakers, and get to know their journeys, dreams, and hopes for the future. The TEDxSFU put together this ‘getting to know you’ video for each of us so that people could learn more about why we do what we do, and how we are at the core. I really enjoyed the interview and the questions they asked, which dared to go where most never go. We Have VR — Now How Do We Use it to Tell Stories? “Stop saying VR is the future of cinema. VR is not the future of anything,” Celine Tricart said, chopping the flat of her hand against the table to punctuate her words. At first, it seemed like an odd thing for someone like her to say. Tricart’s a filmmaker who is passionate about virtual reality — someone who has already made a handful of short films with the technology. When she talks about its potential for storytelling, she does so with an excited smile and distinct glee in her voice. I had just pulled Tricart away from a quick lunch, snuck in between Saturday sessions at Story Summit at The Banff Centre last week. She and more than a dozen other speakers from across North America spent the weekend hashing new ways to tell stories (and, hopefully, get them in front of people.) That includes virtual reality. While we sat in a quiet corner in the dining room, Tricart relayed that quote, which came when another member of the summit argued that filmmakers can’t think of VR as a descendant of cinema. The two mediums are too different, and none of the rules can translate from one to the other. Tricart likened it to saying photography is the future of painting — the comparison does a disservice to both mediums, and prevents people from fully exploring what kinds of stories they can tell with the new approach. “We have to erase everything and start from scratch,” she added. Of course, it’s one thing to say that VR stories need to have a different approach to narrative. It’s entirely another to say what that approach is. Tricart herself is not even really sure. She’s an advocate for the medium, but doesn’t pretend she has a real handle on it. At this point in its history, it is doubtful anyone does. But she does know it’s the emotional connection that VR offers that strikes her the most. What she describes is something entirely different from the way a person connects with cinema. A viewer can become engrossed in a film, but there is always a distance between them and the screen. They are always a passive viewer, watching a curated experience. Virtual reality, however, doesn’t have distance. The mind is tricked, surprisingly easily, into thinking that it is seeing the real thing. “Your brain, on a subconscious level, doesn’t see a difference between the VR and reality,” she said. That connection sometimes comes as a surprise to even the people telling those stories, according to fellow presenter Dylan Pearce. The Alberta filmmaker has worked with VR in various ways, and is now in the process of shooting a film using the technology. He points to the example of Henry the hedgehog as a sign of just how differently audiences react to VR. Henry is the star of a computer-animated VR film being produced by Oculus Rift, the hardware company whose headset kicked off the latest round of virtual reality fever. Henry is a little hedgehog who desperately wants to hug others, but is unable to on account of him basically being a small ball of spines — pretty standard kid’s film stuff. But when the filmmakers showed it to test audiences, their reaction was surprising. Things that happened to Henry that would seem funny or silly on a movie screen became heartbreaking when it happened to a cartoon hedgehog that they (or at least, their subconscious) thought was real. “People felt bad and empathy for the character, rather than laughing along with it,” he said. Both Pearce and Tricart say it’s that connection that makes VR such a potentially-powerful tool for storytelling. Documentary storytelling, especially. Already, filmmakers have experimented with VR to tell the stories of people living in Syrian refugee camps, or showing the viewer the perspective of a child dealing with domestic violence at home. Not just seeing it, but living it. But that potential is not without a lot of responsibility. Denise Quesnel has been interested in VR for decades. Now, as a research associate with Vancouver’s Emily Carr University of Art + Design, she studies the way that virtual reality is changing. And how it is changing us. Storytellers have a responsibility, she said, to their audiences to understand that many of the topics that filmmakers tackle — things like violence and fear — can have lasting, even traumatic effects on the people watching. It’s not just a philosophical question — Joseph Delgado, a gamer who modded Grand Theft Auto to use a VR headset and motion controls, said he felt “guilty” and “horrible” about doing so. It was the same game, but the different mediums created a completely different experience. “The impact of VR is quite serious, it can give you emotionally or socially critical experiences,” she said. They also have to be mindful of the time it takes for the brain to slip out of “virtual reality mode.” Tricart talks about a demonstration with a demo that allowed her to walk through walls — after taking off the headset, she immediately tried to do the same thing in reality. Quesnel admits to trying to sit on VR chairs and couches that she intellectually knew were not there, but nonetheless was convinced that they could support her. “Everyone [who uses VR] has got stories about these things that happen to them. And it doesn’t take long, sometimes minutes, before your brain thinks it is real,” she said. The impact of VR is just one of the many questions facing those involved in the fledgling industry. Tricart, Quesnel and Pearce all readily admit to not having the answers — or even knowing whether the questions can be answered. That can cause a bit of anxiety. But it’s also one of the things that explains their passion for VR — a new medium, fundamentally different from the ones that came before it. And the freedom it provides to find brand new ways to tell stories. “I think we have so many amazing things to do with VR to make this world a better place .. we can show different perspectives on things,” Tricart said near the end of our chat.